In the works of the ancient masters there is an understanding that all of light is not just composed of what the industrial and scientific communities have to say and demonstrate. The light of our world is not singular in nature. The light of our world is based on many levels that are only restricted by mankind’s present level of awareness and understanding. The indwelling light of the seers and Magi are levels that mankind as a whole has not even contemplated. Our perspective is that the work of light at this time is to renovate and realign our thoughts about life. Light illuminates the darkness. Light guides the traveler on his or her way through their journeys through life. Light is a beginning within a cycle and light illuminates the way. Where does light come from? Light is seen and accepted as rays of the sun. For some, light is seen as an expression of the higher self. Light in certain circles comes from a spiritual center or great central sun, not just the sun we see and are aware of. Light manifests through the energy of the particles that make up the universe or so some would think. Throughout time, darkness is experienced not just when night falls but in the heavens above. Darkness is experienced in the earth in caves and in tunnels. The universe is made up of dark matter, dark energy and a lack of knowledge. The use of light in our world has been to achieve things of the physical reality we dwell in. Light allows us to study at night in our rooms. Light illuminates the screens that occupy our senses and time. Light is the vehicle by which distance is measured and light is seen as bendable, responsive and available. A laser demonstrates the ability and power of light. The knowledge of light brings understanding and an inner sense that there is something more. The levels of light illuminate a person’s ability to function beyond just what is seen, felt and heard. The mystic sees light differently than most of us. The advanced soul experiences worlds that are not held by the confines of limited beliefs or structures. We are moving through the cosmos but we feel none of the motion. We are at our core a light essence that does not experience its true nature. Wonders of the existing world occupy our focus. 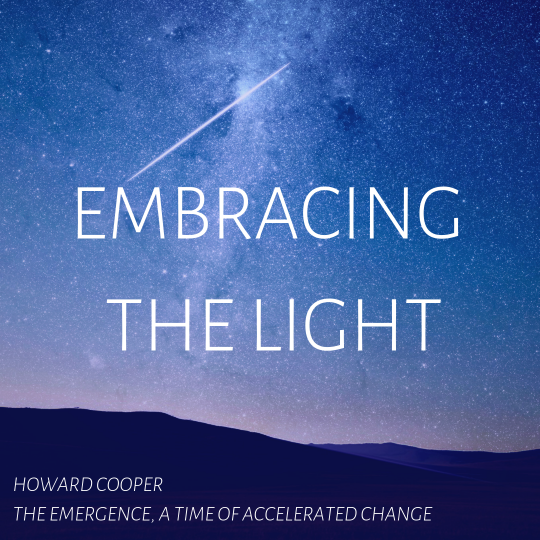 To embrace the light requires one thing of us; it requires our willingness to let go of the state of awareness that encompasses our beliefs in separation and self-denial. We are lights of varying degrees of awareness. We have built our temple of self out of the stream of consciousness we have accepted as a representation of who we are. The light that comes forth now asks us to be aware of the shifting foundation upon which our world stands. The intensity of the world vision is based on the light that springs forth through the cycles of our existence. The time for the risen light in all us is coming not in the future but in the present moment that occupies our awareness. This light does not bring just change; it brings opportunity. As the light of earth increases so too does our ability to see the future in a new light. Let us begin the journey of light together by combining our efforts to see what unites us and not divides us. The road to the future is lit by our intentions. Let us awaken our intentions to a new level based on harmony, unity and love. For the light of the time requires us to awaken from the darkness of our present perception of self and seek alternatives to the world we have inherited. Join Us for a Book Signing April 13th!